This entry is a bit of a placeholder, in hopes that somebody will find it in a google search and maybe chip in more information. It’s very odd that searching on “Take Care of Scabbard Fish” brings up almost no results. Even more weird that it doesn’t come up on sites like discogs or allmusic. 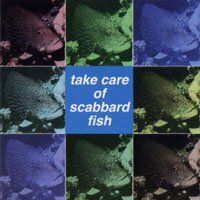 Take Care of Scabbard Fish is a 1994 compilation released by Japanese record label Scabbard Fish (I think?) Its claim to fame is that it contains the first track released by the band Boris. A general description would be that this stuff is Japanese noise/rock from the mid-90s. Lots of feedback, lots of jangly guitar, some stuff bordering on surf rock. But not a lot of it is noise-noise, like beatless, screeching, experimental noise; a lot of it has a heavy groove to it, like basement alt-rock without commercial goals. It’s good stuff.